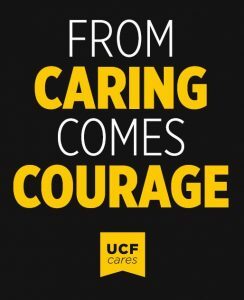 UCF Cares is an umbrella of care-related programs and resources dedicated to fostering a caring community of Knights. 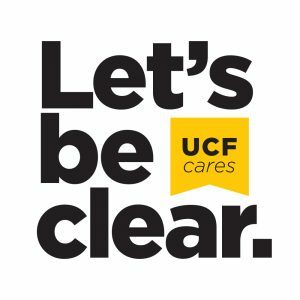 Let’s Be Clear is UCF’s source for information about identifying, preventing, and responding to sexual misconduct including sexual assault and sexual harassment. Counseling and Psychological Services (CAPS) is the only free-of-charge campus agency designated to provide comprehensive psychological services to university-enrolled students. 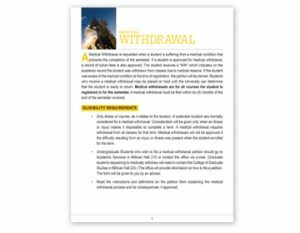 UCF Victim Services provides advocacy and support to the UCF Community, 24/7, including weekends and holidays. 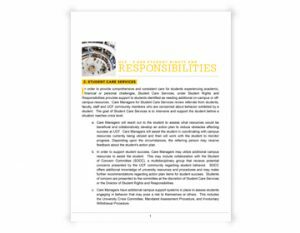 The Office of Student Rights and Responsibilities (OSRR) promotes a campus climate of integrity, civility, accountability and student well-being by providing a wide array of resources, education, and support services for the university community. The Knights Helping Knights Pantry is committed to serving UCF students by providing basic needs including food, clothing, and personal hygiene items to foster continued academic success and increase retention for students in need.